28th September – (time 6pm) The Kings Arms Festival, Salford, 11 Bloom Street, Salford, M3 6AN. 27th July – accompanying Sebastien Degorce – 9pm – free – Nelsons Wine Bar, Crown Street, Hebden Bridge. Please leave suggestions on this blog for places to perform moneyisasinnocentasthegun during the Brighton Festival. So far 12th May – American Express (old building) 1pm, 13th May – Primark (Brighton) 1pm, 15th May – Barclays bank, North Street, 1pm. Plus at the Cowley Club on the 21st May at 8.30pm. 28th September – 4pm at The kings arms , salford. 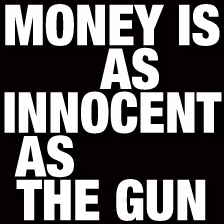 19th November – 8pm at Nelsons Bar, Hebden Bridge – ‘moneyisasinnocentasthegun #1’ mixed with flush fiction. The eigth public space performance will begin outside harvey nicols on st andrews sq at 11am – 18th August. Please come along or watch on line by clicking the live stream LINK below. Sorry about there being no streaming of the performance at the RBS on the 17th August – There was a technical problem that no one could figure out -There is some footage that will be uploaded soon. The seventh public performance will take place on the 17th August – 11am at the Royal Bank of Scotland, st andrews square, Edinburgh. Please come along to support and or watch this performance as it may involve the performer coming into direct engagement with the bank and it’s allies. The sixth public performance will take place on the 16th August – 5.15pm at Primark on Edinburgh’s Princess St. The performance will take place in and out side the store. Please come along or watch the show by clicking the live stream link below. The forth public performance will take place on the 14th August – 3.45pm at the Edinburgh Woolen Mill on the Lawnmarket. The third of the public performances will begin outside the Edinburgh international conference centre, which is a cavernous space surrounded by towers of power. The piece will begin at 3.15 on the 13th August, please come along. The second public space performance will happen at the money musuem at 3.15pm on the 12th August. http://www.museumonthemound.com/. Please come a long or watch the performance on the live stream link below. The first of the public space performances at the edinburgh festival will take place outside the scottish parliament at 12.45 on the 11th August. Please come along or watch via the live stream link.